Jennic Ltd, whose products are available through GLYN High-Tech Distribution , and Mitsubishi Corporation (MC) have announced a partnership agreement in Japan to serve the emerging markets for low power wireless technology. Jennic’s wireless solutions target the broad markets of Energy and Environmental Management, Active RFID, and Consumer Electronics. With a strong product portfolio of wireless microcontrollers, modules, evaluation kits, software stacks, recent product announcements for the JN5148 ultra-low power wireless microcontroller, an RF4CE demonstration system and escalating developments with ZigBee PRO, 6LoWPAN and Smart Energy solutions, Jennic positions itself to deliver world class technology into today’s high growth markets. MC and Jennic have already demonstrated a strong working partnership, with MC already supporting Jennic’s JN5139 wireless solution into the prominent leading Japanese consumer-electronics producers’ new range of Power Consumption Monitors. In a related development, Jennic has announced recently the release of JN5148 ZigBee PRO Evaluation Kit and JN5148 modules. Customers with JN5139 Evaluation Kit (JN5139-EK010) can upgrade to ZigBee PRO by ordering the ZigBee PRO Upgrade Kit. 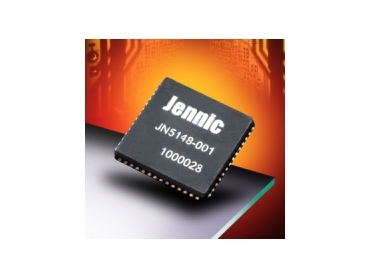 The JN5148 32-bit wireless microcontroller achieves a system operating current consumption of 18mA when receiving, and 15mA transmitting at +3dBm, which is typically 35% lower than current solutions. With 128kB ROM, 128kB RAM and enhanced coding efficiency, the JN5148 has sufficient space for developers to integrate their embedded application software and the ZigBee PRO protocol stack into a single chip. It can also be used as a co-processor, enabling ZigBee PRO to be added easily and quickly to existing systems. Programmable CPU clock speeds from 4 to 32MHz and the use of five separate power domains provide the ability to select low power or high performance up to 32 MIPS CPU operation for the JN5148 to be used across the full range of applications from low-power battery-backed networks to high I/O, processor intensive systems. A unique patent-pending Time of Flight ranging engine integrated into the device revolutionises location-based services for sensor networks by providing improved accuracy over conventional signal strength based systems with little incremental cost.